Looking for a new idea for using those Thanksgiving leftovers? 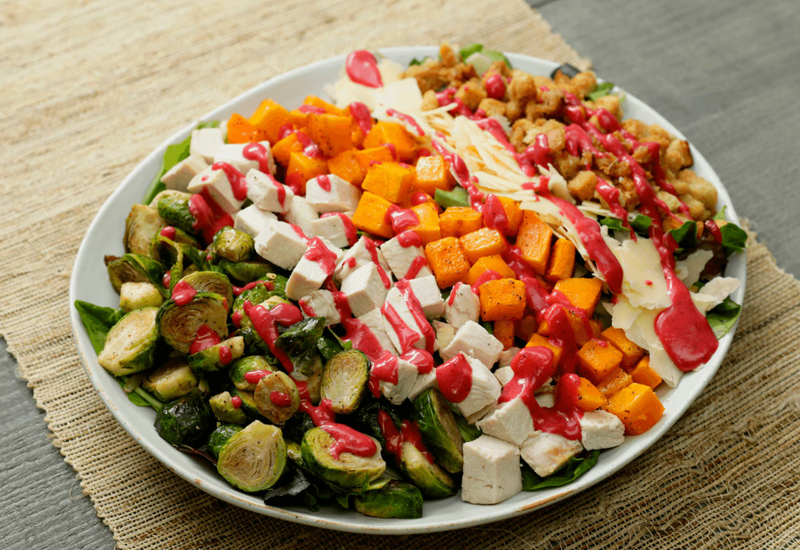 Cranberry sauce is transformed into a sweet and tart dressing, stuffing is turned into croutons, and leftover turkey, Brussels sprouts, and butternut squash are the main component of the salad. All the flavors of your Thanksgiving plate can be brightened up the next day in a hearty salad that is truly the ultimate fall harvest meal. No leftover cranberry sauce? Use ¼ cup of whatever fruity jam you have available instead! If you had other vegetables on your Thanksgiving menu, use those too! Roasted veggies or green beans make great salad components. Any kind of green can be used in place of the mixed greens. Kale, spinach, or romaine are good salad greens. Per Serving: 384 calories; 22g fat; 36.2g carbohydrates; 14g protein; 26mg cholesterol; 679mg sodium. huge, bountiful salad. I added pears and blue cheese. This salad is so delicious! Hubby and I prepared it this afternoon. So good and perfect way to use leftovers. Delicious salad! The cranberry sauce dressing is incredible! The fact that I literally made croutons out of stuffing is mind blowing! Such a fantastic idea. I skipped the Brussels sprouts and used only leftovers that I had from Thanksgiving dinner. It would be a shame to make this only once a year. I'm going to make it again soon! This was a great use of my Thanksgiving leftovers. I didn't make the cranberry dressing, but other than that made no changes to the recipe. We used baby spinach bandit was fresh and delicious.